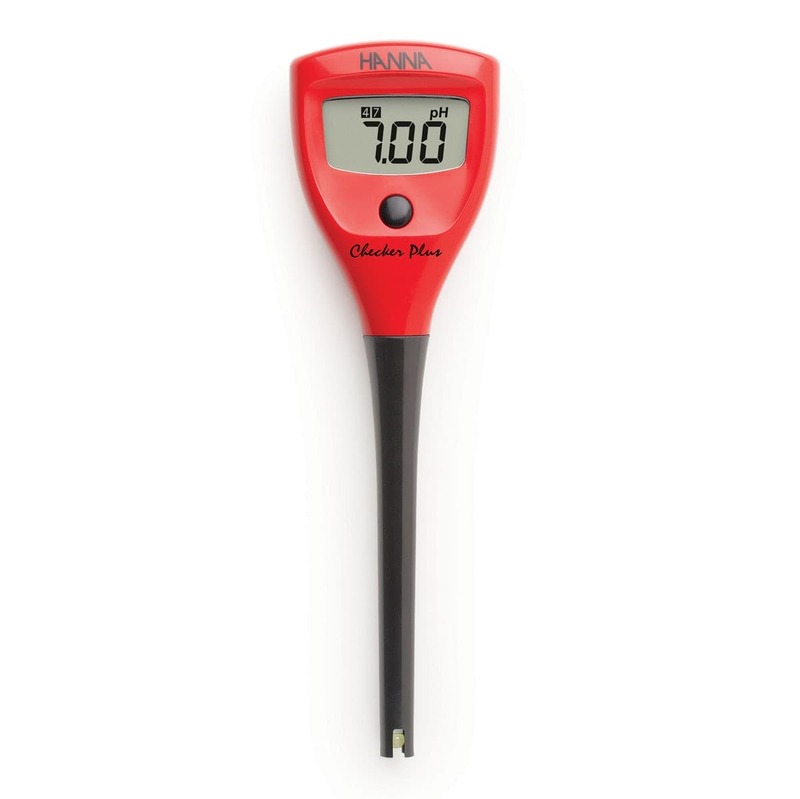 The HI98100 Checker Plus pH tester has been designed with many advanced features while maintaining the look and feel of the original Checker. The Checker Plus now offers automatic calibration to one or two points, automatic buffer recognition, calibrated buffer tags, stability indicator, low battery indicator, and selectable automatic shut off. The Checker plus still maintains the iconic pentagon design with a probe that measures 103 mm in length and tapered to a 8 mm diameter making it ideal for test tubes and vials. Economical – The Checker Plus is a full-featured pH tester at a price that anyone that needs to measure pH can afford. Large LCD – Enhanced LCD that displays reading, stability indicator, low battery indicator and calibration tags. Replaceable pH Electrode – The HI1271 supplied gel filled pH electrode is 103 mm long and tapers to an 8 mm diameter at the sensing end. 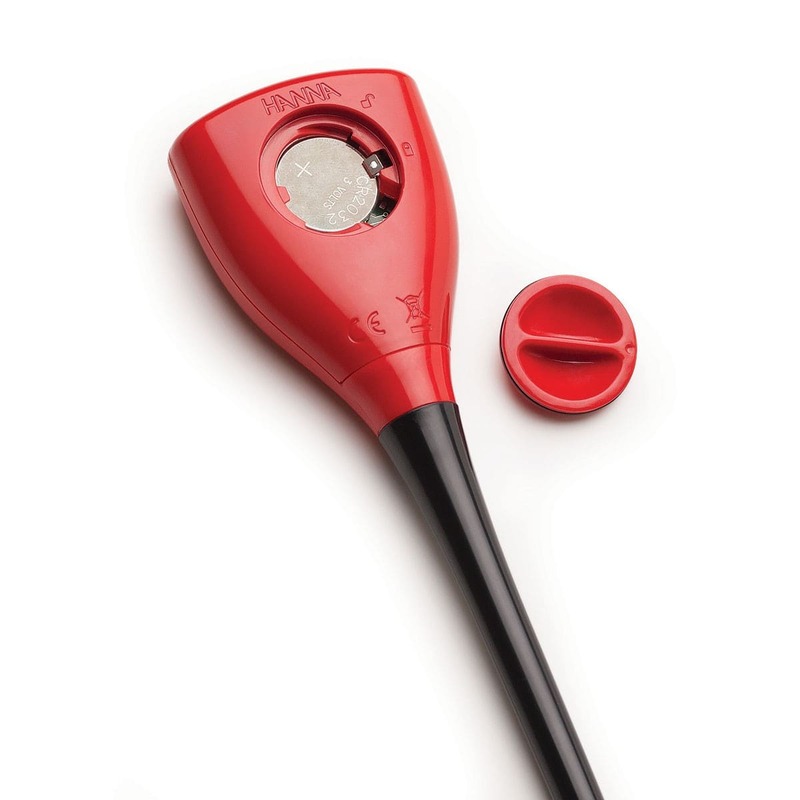 This narrow electrode easily fits into test tubes, vials, and other containers with small opening. Automatic Calibration – The Checker Plus is calibrated automatically to one or two points. The calibration buffers are automatically recognized and after calibration the buffer values used are shown on the display as a tag. Stability Indicator – An hourglass indicator is displayed on the LCD until a stable reading is obtained. Once a reading stabilized the indicator disappears and a reading can be recorded. Automatic Shut-Off – The meter can be set to automatically turn off after 8 minutes or 60 minutes to conserve battery life in the event that the meter is left on. The auto off feature can be disabled. Long Battery Life – The Checker Plus has an exceptional long battery life of approximately 1000 hours. When the battery power is running low a low battery indicator is displayed. Plastic Carrying Case – The HI98100 Checker Plus is supplied complete with meter, probe, calibration solutions and cleaning solutions packaged in a durable plastic carrying case. HI98100 is supplied with HI1271 pH electrode, HI70004 pH 4.01 buffer solution sachets (2 x 20 mL), HI70007 pH 7.01 buffer solution sachets (2 x 20 mL), HI700601 electrode cleaning solution sachets (2 x 20 mL), instruction manual, instrument quality certificate and plastic carrying case. 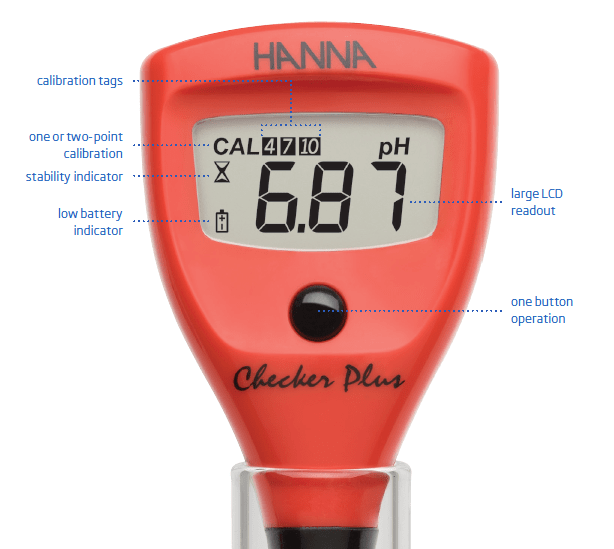 The HI98100 Checker Plus is the next generation of the original Hanna Checker pH tester. 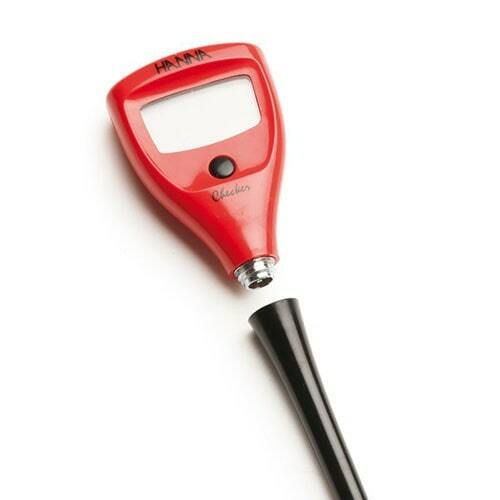 The Checker is the most popular pH meter in the world with over 1 million meters used since its introduction in 1991. From students to researchers, the Checker has been helping people with their pH measurement as a meter that is simple to use and operate.